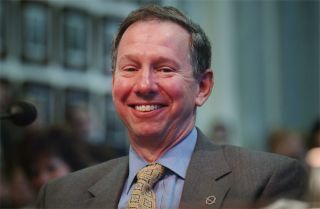 Michael Griffin, 11th Administrator of NASA, at his Senate confirmation hearing on April 12, 2005. Former NASA AdministratorMike Griffin is unshakably opposed to switching from NASA's Ares I rocket to anupgraded Air Force Evolved Expendable Launch Vehicle, or EELV. The ColumbiaAccident Investigation Board recommended that NASA retire its aging shuttlefleet as soon as possible. The design of any replacement "should giveoverriding priority to crew safety," the board said. "Our probabilisticrisk assessment for loss of crew on Ares Ishowed it to be twice as safe - I repeat, twice as safe - as a human-ratedEELV-derived vehicle," Griffin saidrecently. "This figure of meritwas a significant factor in our decision to go with the shuttle-derived Ares I,yet is ignored by almost everyone suggesting we make a change," he said. "I cannot responsibly ignore it, for reasons having nothing to do withmoney." Longtime NBCNews correspondent Jay Barbree thinks NASA should stick with the"single stick" rocket rather than shift to modified military rockets. A Merritt Island resident whohas covered NASA for more than half a century, Barbree favors the Ares I rocketbecause it is designed to fly astronauts rather than satellites. "The thing to do iscontinue on the track that they're on," he said. "The quicker theycan get the space shuttle retired and get the Orionspacecraft built, the better off this country is going to be." He also thinks it's time toventure once again beyond Earth's orbit. "Earth is a spacecraftthat's 8,000 miles in diameter, and all of us are on it. But it won't lastforever," he said. "It's our cradle. But we cannot live in a cradleforever." Charles Mars is big onoptions, and he thinks the Obama administration should consider launchingNASA's Orion space capsules on military rockets already flying from CapeCanaveral. A retired NASA engineer whoworked on Mercury, Gemini, Apollo, Skylab, the shuttle and Space StationFreedom, Mars wants a committee to be formed to "take a look at the DeltaIV and Atlas V and see if there is an alternative" to NASA's Ares Irocket. NASA should extend theshuttle program and see if military rockets might obviate the need to pay Russiato fly U.S. astronauts to the International Space Station, the Titusvilleresident said. "We don't need to berelying on the Russians or anybody else to help our space program," Marssaid. "To have to depend on them to take our astronauts and our logisticsup is just not good." Clickhere to view Florida Today?s Flame Trench Blog for a larger view ofthe paper?s Rocket Comparison Chart and link to PDF version. Publishedunder license from FLORIDA TODAY. Copyright? 2009 FLORIDA TODAY. No portion of this material may bereproduced in any way without the written consent ofFLORIDA TODAY.